For those of you who grew up either chopping your own wood or buying split wood and storing it for the winter, you can easily recreate the look in your own home without the hassle using the Real Fyre Split Oak Gas Logs by Peterson. Each set of gas logs looks like the split oak wood, cured for seasons that you remember. The logs not only look great, but are constructed of the highest-quality materials in the industry and reinforced with steel rods. The gas flames dancing realistically through the holes in the top logs provide the finishing touch. You don't need to give up the homey look of split wood and you don't need to break your back trying to fill up the woodpile. All you need is a set of Real Fyre Split Oak Gas Logs by Peterson and you and your family can continue to have your winters the way you like them. Looks and feels better than my wood burning fires. Easy to install and easy to use. I will never go back to wood burning in my fireplace. ConsPilot was not adjusted properly. Bad thermocouple after 1st ignition. We were very pleased with the timeliness of delivery and the realistic appearance of the logs. We had the local LP gas supplier install the log set with remote and it looked and worked better than what we had expected. About a week later, it was cool enough to fire it up again. We discovered that the pilot light had gone out. Following the directions, we were able to ignite the pilot but it would not stay lit. A technician from the LP supplier returned and discovered a bad thermocouple, replaced it and now the set works like a charm. Would have given 5 stars except for the added expense of a 2nd visit by the LP tech and cost of new thermocouple. Super quick delivery from this company, very easy to install. ProsRealistic, and puts out good heat. Very realistic log, heavy and solid. Easy to stack and arrange. Shipped on time and in tact. The delivery process was second to none in that all of the logs arrived in better condition than I was anticipating, taking only two businesses days to arrive. I am literally astounded at the quality of both the service and the product that is offered by this company. These logs are simply amazing to watch and use. 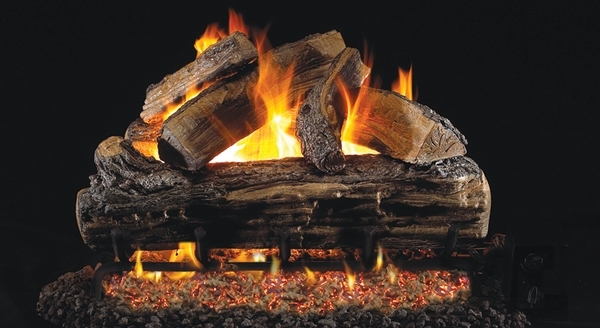 These logs look simply stunning as they sit in the hearth of our fireplace. Best of all, they are heavy, not flimsy and lightweight like other bargain gas logs. They are a great buy. I have decided that my satisfaction with this product is such that if I needed to go out and buy it all over again, I would buy the same product. Because of where we live, we find it to be a necessity to run this every night starting in late night and continuing until early February. What makes this product so special is that it looks so realistic, produces a fire that is nice and warm, as well as is able to prevent the messes associated with wood fires. The only negative per se is that the embers could look a little more realistic, but other than that, it is a great buy. What really amazes me is that when you look at the price and then compare it with the results that we get from this amazing product, it quickly becomes apparent that we did not sacrifice any quality whatsoever. Simply put, my husband and I could not be more satisfied with the results of this set of logs. Installing it was really quite easy, partly because my husband is quite the handyman when it comes to using tools. We did do some experimentation with regards to placement of the logs and the furniture, finally deciding to settle on a set up that really makes things look nice. First, the gas logs are absolutely perfect. I looked at many alternatives before choosing the Real Fyre Split Oak, and am very happy with the realistic look and beauty of the set. Second, I would like to thank this store's support staff. When FedEx delivered the logs, they accidentally dropped them off the back of the truck and broke one of the logs. They left before I was able to open the box, however. customer support express shipped a replacement without any of the usual stress that can often accompany such situations. ProsGenuinely realistic appearance to the logs and the flame patterns. I have concluded after purchasing this log set that the appearance and functionality of Peterson gas logs is unsurpassed. Thankfully, there are many other positive attributes to speak about, namely the fact that the installation was extremely straightforward. The only thing that was a challenge was getting everything hooked up, but after that fell into place, the rest was a tremendous breeze. The comments since have continued to come, from many people looking on in admiration who feel that this log set makes my fireplace look simply stunning. I will never cease to be amazed at the ease a person can operate this set of logs and get a fire going. Best of all, it looks amazing as it sits on the hearth of my fireplace. This is a very safe product that is attractive and definitely is worth the price. Overall this has proven itself to be a good product that functions quite well. It was relatively easy to install using only a small wrench. Sadly, this product does not have the best heating value, but that is not the systems objective. What impresses me the most about this unit is its realistic appearance; additionally, I am particularly satisfied with its energy output. Over the course of a month my wife and I found ourselves driving around the town to find a replacement gas log set for the poorly made one that the builder installed. After a thorough search, we settled on this product, saving hundreds of dollars in the process. Even though this set of logs has been in our possession for a month, we find ourselves using it regularly every night. Overall, this is an excellent buy! In my mind, this is an excellent product that possesses absolutely no shortcomings. It looks terrific and puts out a sufficient amount of heat. I am disappointed to report that the installation of this product by a propane company was a major challenge. The instructions need to be rewritten. Everyone in my family has come to the conclusion that not only does this product look terrific but also it functions at peak efficiency. Additionally, the ambience it generates is second to none. The only real quibble that I have with this product is that the embers that it simulated do not look as realistic as I would desire for them to appear. Aside from this, the product has proven to be a terrific buy, making the prospect of sitting around the fireplace a much more enjoyable task. Best of all, no firewood needs to be purchase or stacked, and even better, the chore of cleaning up ashes from the fireplace after a fireplace is no longer an issue. All I can say is that this product looks great and everyone in the family is quite pleased with the results. I made the decision to purchase this set and then have it installed by a professional, and I am quite happy to report that it was a good call. Once it was put in, I was amazed at how good it looked overall once it had been fully installed into my fireplace. For a long time now our family has been looking around for gas logs, and we finally came to the conclusion that this product would be the right ones for us to get. We have only used this set a few weeks, but we are happy to report everyone is quite satisfied with the results. The very first time I laid eyes on this set after purchasing it left me stunned. I simply could not believe how realistic it looked. It has proven to be an excellent choice for our home. We absolutely love having made the decision to purchase and install it.